Tōji (東寺; とうじ) is a Buddhist temple of the Shingon sect in Kyoto, Japan. Its name means East Temple, and it once had a partner, Saiji (West Temple). They stood alongside the Rashomon, the gate to the Heian capital. The famous priest Kobo Daishi (Kukai) founded Tōji in 823 A.D. by order of Emperor Saga. The temple’s formal name is Kyo-o Gokoku-ji (教王護国寺), indicating that its function was protection of the nation. Its principal image is of Yakushi Nyorai, the healing Buddha. 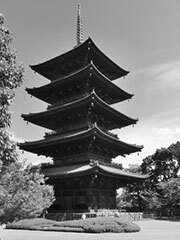 The pagoda of Tōji stands 57 m high, and is the tallest wooden tower in Japan. It dates from the Edo period, when it was rebuilt by order of the third Tokugawa Shogun, Iemitsu. Recognizing the historical and spiritual significance of Tōji, UNESCO designated it, along with several other treasures in Kyoto Prefecture, as a World Heritage Site.